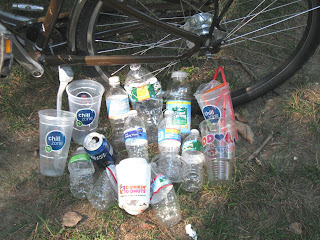 Mrs. Trashpaddler and I pedaled our bikes from Ayer to East Pepperell this afternoon and rounded up this bunch of mostly plastic castoffs. They numbered 15 and only one had redemption value. Our Massachusetts Legislature could remedy this situation tomorrow, or not.